Antique size is approximately 48 inches by 72 inches. Please choose your color and then your bed skirt drop height. 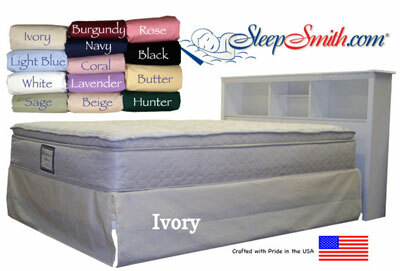 Your drop height is measured from the top of your box spring, NOT your mattress. 14 inches is the standard bed skirt drop height, but with so many frame and mattress choices these days, you may need another size. Please make your choice in the bed skirt drop height box. There is no extra charge for the various heights. The bed skirt drop material is 200 count poly/cotton fabric meant to match the sheets and comforters that are 200 thread count. The top portion of the bed skirt, the flat area that lays between the mattress and the box spring, is made from a white 50/50 poly cotton blend. This is the part of the bed skirt that you will not see once the bed is made up. We will custom make your bed skirt in the color you choose and in the drop height that you need. Please allow about two weeks to receive this. This product is made in the USA by hard working citizens. Antique size is approximately 48 inches by 72 inches. The bed skirt drop material is 200 count poly/cotton fabric meant to match the sheets and comforters that are 200 thread count. The top portion of the bed skirt, the flat area that lays between the mattress and the box spring, is made from a white 50/50 poly cotton blend. This is the part of the bed skirt that you will not see once the bed is made up. We will custom make your bed skirt in the color you choose and in the drop height that you need.